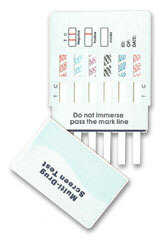 Using this remarkable new 6 Panel drug testing kit, you can make that your system is free of all toxins and go to take the actual drug test with confidence. You asked for an easy, affordable "upgrade" to the popular single panel and 5-panel marijuana THC home drug test kits, and delivered! The Six Panel Test Kit is a great product for detecting marijuana THC in urine, plus this kit will test for five other drug metabolites -- cocaine, methamphetamines / amphetamines, opiates, benzos, oxycodone and other types of opiod pain meds.